My Berries is your Australian frozen berry specialist. hand-produced. Each berry is carefully hand-picked, washed and frozen before being packaged into convenient zip-locked pouches. Our range includes raspberries, strawberries, blueberries, mangoes and mixed berries. They are versatile - perfect for adding to any powerful breakfast combination including smoothies and an essential ingredient for baking, sauces, ice-cream, ice-pops or even a cheeky cocktail! Conveniently packaged in 300g, 800g and 1kg stand-up, zip-lock pouches for retail sale and food service. At My Berries, we only work with quality growers who pride themselves on producing beautiful berries. All of our growers have current Freshcare certification, demonstrating that they adopt the highest quality management standards in growing their produce. This isn’t just a paperwork exercise. Each farm receives a thorough audit every year to ensure that the standards are maintained. The standards assure continuous food safety and quality requirements are met on-farm. Another beautiful Australian grown berry joins the My Berry collection. 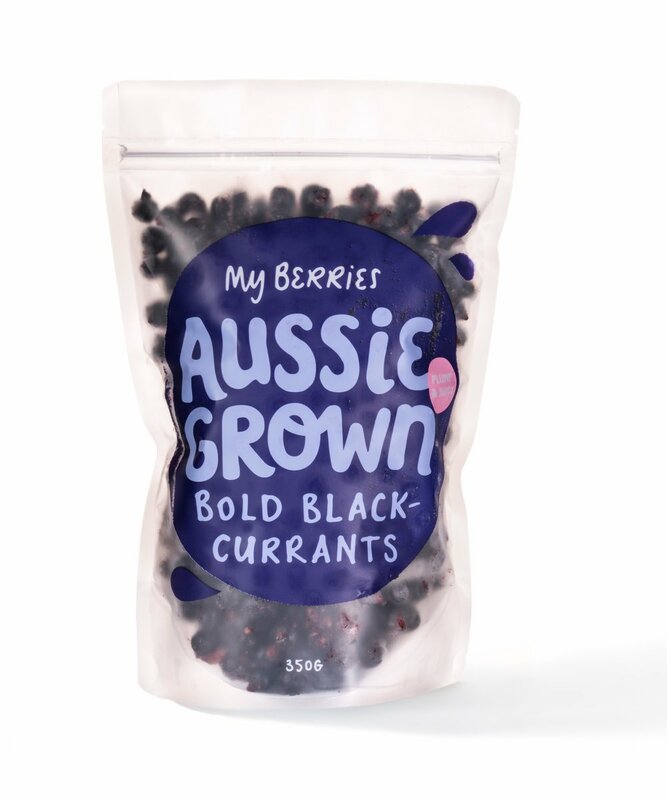 Grown by our friends in Tasmania, we are excited to experience the flavour and nutritional benefits of blackcurrants, especially since they don’t grow well here in sunny Queensland. The Blackcurrant Foundation in the UK suggests blackcurrants are great for your cardiovascular health, brain function, urinary tract health, digestion, vision and even sorting men’s business. Recent research suggests that blackcurrants could dramatically reduce the risk of erectile function. Oops, did we just say that? Yes, we did…and it’s true! Our blackcurrants are big-hearted in every way! For more information about their wonderful health benefits visit www.blackcurrantfoundation.co.uk. So, exactly how can you incorporate blackcurrants into my diet? We suggest throwing a few into my favourite smoothie and creating an array of sweet and savoury dishes, jams, jellies and syrups. Enjoy. Our blueberries are grown as far south as Northern New South Wales and as far north as the Wide Bay Burnett region in Queensland. The climate varies from region to region enabling us to enjoy blueberries for most parts of the year. Each blueberry has been carefully hand-picked and packed and their versatility means they are more than a fantastic kick-start to your day. Our blueberries are the perfect summer snack straight from the freezer or in smoothies, muffins, tarts, sauces, ice cream and ice pops. We have a plentiful supply of strawberries as our very own Moreton Bay region produces a whopping 40% of Australia’s strawberries. The season kicks-off in May and ends in early October. Each strawberry has been carefully hand-picked, washed and hulled for your convenience. No need to worry about taking time out of your busy day to remove those green stalks; we’ve done the hard work for you! Our strawberries are perfect in smoothies and baking, for making preserves, sauces, ice cream and sorbets. A little blue, a lot of red and a lick of local love. We have blended our favourite berries all by hand and they are so, so versatile. Use in any breakfast combination, baking or garnishing desserts. Our parents tell us that the female members of their local Fishing Club enjoy pouring frozen mixed berries onto their pavlovas as it is so quick and easy. Is that cheating you ask? Sure. But sometimes time just isn’t on our side and, in our opinion, the quicker you can get a slice of creamy, fruit-laiden pavlova into your mouth, the better! Our raspberries are sourced from growers in the Moreton Bay region. Raspberries that grow all year around are referred to as ‘primocanes’. Our family was the first to trial these all-year-round raspberries back in 2008. 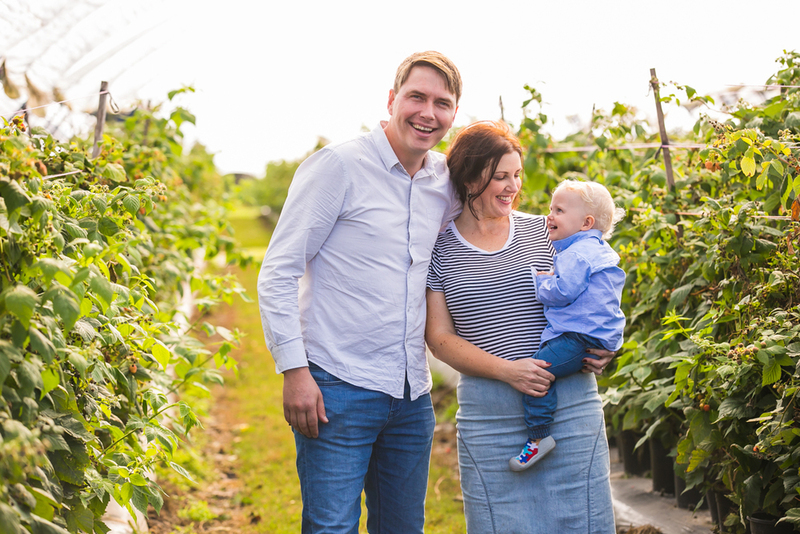 Our family has truly led the way in developing raspberry yields, quality and taste in our region. Each raspberry is carefully picked and packed by hand. They are the most delicate of all of our berries as they can easily crumble or break when being removed from their flower. Extremely high in antioxidants, our raspberries provide you with a powerful start to your day. There are also perfect in smoothies, baking and for making preserves and sauces, ice cream and sorbets. P.s. Little people love munching on frozen raspberries too! There are three core team members at My Berries headquarters: Directors Allison and Stuart as well as our 'Chief Taste Tester' - baby Luther. We met in London, worked hard, travelled and tasted some amazing foods from around the world. In 2012, we returned home to marry, start our business and create our own little family. Stuart has a background in the hospitality sector and, as an executive chef, has set up various restaurants and production kitchens. His family are berry growers so creating delicious berry products really was a no-brainer for us. Allison holds a Master of Science degree in regulation, so she does all the checks and balances on everything we do. On our days off, we love going to the beach. Get to know your berries! freshest berries to the people of Brisbane. freshest berries to the people of Brisbane.